Kharkiv, Ukraine – There has long been a sense of separation in Ukraine, with the east closer to Russia and the west having more affinity with Europe. In Kharkiv, that split deepened five years ago. As Kiev celebrated the ouster of the country’s pro-Russian President Viktor Yanukovich in 2014, a large portion of people in Kharkiv – just 30km from the Russian border – felt threatened. Pro-European demonstrations born in 2013 on Kiev’s Independence Square – known as the Maidan protests – were copied in the country’s second largest city, but the croweds were never more than about 300 people. In contrast, a sprawling pro-Russian protest camp occupied the central square in 2014 with Russian flags on display. “Many Kharkiv residents took it [the ouster of Yanukovich] as a coup because more than 60 percent of the population [of Kharkiv] traditionally supported his Party of Regions,” said Andrii Borodovka, journalist and Kharkiv resident who took part in anti-Maidan protests in the city in 2014. 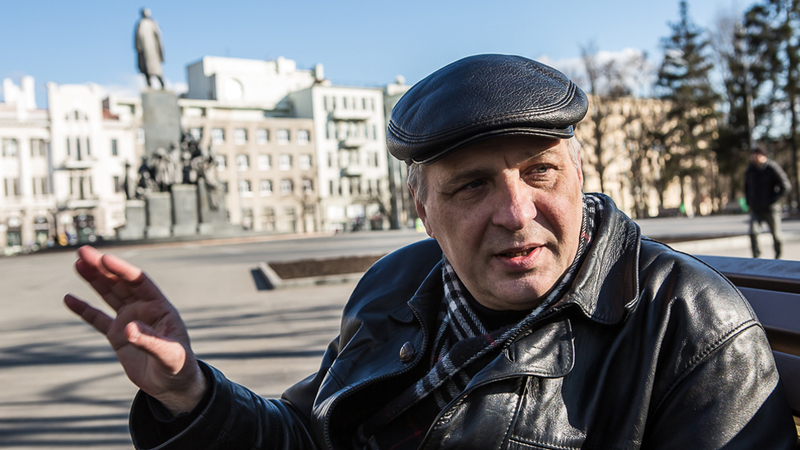 “When there was a change of government in Kiev, many people [in Kharkiv] saw it as a threat. There were fears that restrictions would be introduced, the Russian language would be banned and fascism would start,” he told Al Jazeera. In 2016, Borodovka, who wrote critical articles about the Maidan protests, was arrested for undermining the territorial unity of Ukraine. He was given a three-year prison sentence, with two years of it suspended. The pro-Russian sentiments that led people like Borodovka to take to the streets also helped prompt the annexation of Ukraine’s Crimean Peninsula by Russia and the seizure of large parts of the eastern regions of Donetsk and Luhansk by Moscow-backed separatists in March 2014. Ivanna Skyba-Yakubova, a Maidan supporter and co-founder of the Help Army volunteer group that provided material assistance to the Ukrainian soldiers when the war broke out in the east, told Al Jazeera that Moscow had a plan to for Kharkiv’s secession as well. The worst-case scenario was avoided in Kharkiv, but the scar remained, according to Skyba-Yakubova. She said as she watched Maidan supporters and their detractors clashing in Kharkiv, “I had a feeling that my city was being taken away from me. There was a crack in the society. There was a colossal level of mistrust,” she said. The differences that led to the split in the society in many parts of Ukraine do not seem to have been addressed. Many Ukrainians, especially those living closer to the Russian border, feel that the government in Kiev does not understand how the conflict with Moscow hurts its population, for the sake of forging closer ties with the European Union and NATO . Donbass is the Ukranian area that includes Donetsk and Luhansk. Olenchenko considers Ukraine’s current government illegal which has her considering staying away from the polls in the upcoming presidential election. In contrast, Serhii Maliutin, 21, an internally displaced person who fled Yenakiieve, a city in rebel-held Luhansk region in late 2014, plans to cast his first ever ballot for the candidate who will pay attention to the needs of the young people. “The new generation needs support from the new president. Nowadays, a growing number of students go abroad to study and then they never come back,” he told Al Jazeera. Maliutin is a student of international relations at Kharkiv’s Karazin University, where he said degree is no guarantee of a job. According to the American Chamber of Commerce in Ukraine, approximately five million Ukrainians, about 25 percent of the country’s economically active population, work abroad. But the biggest problem on voters’ minds is the country’s crippling corruption. President Petro Poroshenko and his post-Maidan government did not do enough to crack down on the system that allowed corruption to flourish. The National Anti-Corruption Bureau of Ukraine (NABU) was set up without the establishment of an anti-corruption court that would allow it to follow through with its investigations. Subsequently, the money stolen from the state coffers during Yanukovich’s government has not been recuperated. And corrupt officials from his era have not been tried. “No revolution brings healthy changes very fast. We did not expect that in the very first year or so we would live wonderfully,” said Skyba-Yakubova. Ukraine’s presidential election is scheduled for March 31 with a record number of candidates vying to become the war-torn country’s sixth president. According to opinion polls, Poroshenko is trailing in the third spot behind opposition leader Yulia Tymoshenko and the front runner, comedian Volodymyr Zelensky.